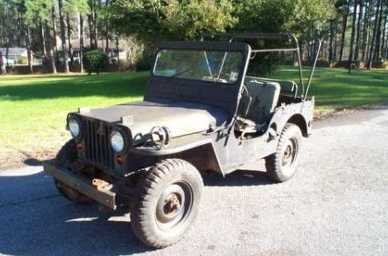 In 1997, I purchased a 1953 Dodge M37 from a farmer just outside of Huntsville, Alabama. Since then, I've been working steadily on the M37. I put together some pages to show what I had done with it over the years, and to share what I learned and continue to learn along the way. I decided that the M37 was so much fun that having another project would be a good idea. Perhaps this thought came to me when I was lounging around the house one day realizing that I didn't need to do anything to the truck at that moment, but that I had the urge to turn wrenches... After a bit of casual looking, in January 2003, I located a Willys-Overland 1951 M38 1/4 ton truck (jeep) that was priced right, needed work that I felt comfortable performing, and that would fit in the garage. After getting the M38 home and spending a little time evaluating it, I have decided that the thing to do is to return it to as close to original as possible without being too fanatical or neglecting aspects of safety or ease of maintenance.